I've noticed this trend in Electronic shows and elsewhere. 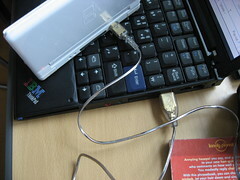 More and more devices are being charged with the standard USB interface. This is great. The old complaint of a bundle of non-standard charges might be finally on the decline! *Standards* folks, learn to love them.